The art of kissing in different cultures varies. Kissing has long been considered an act of intimacy, closeness and familiarity. Kissing each cheek is a sign of friendship and welcome while kissing on the mouth signifies something deeper and more meaningful. Despite Western fascination with kissing, it is not the same in all cultures and is actually absent in some. For example, kissing is not a recognized practice in some South American tribes, in Somalia and on some South Pacific islands. Where did kissing start? How did it become associated with acts of intimacy? No one is absolutely certain although some theories suggest that kissing goes back to mothers and infants. Before the days of jarred baby food, mothers would have to chew up their infants food for them and the act of passing the food from her mouth to the child's could be considered an act of great intimacy and affection. After all, the mother was ensuring her child's survival. When lovers in the United States share food, they may kiss and swap gum and food tastes from mouth to mouth in more passionate imitation of this early practice. Not everyone kisses with their lips. In the cold, snowy regions of Alaska and Canada, the Inuit tribes do not kiss by touching lips but rather by brushing their noses together. 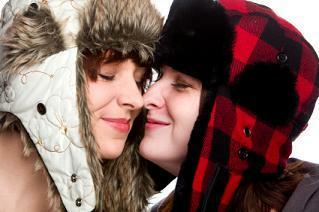 Eskimo kisses are a recognized practice around the world. Speculation suggests that the affection of rubbing noses and sharing breath puts the participants face to face, but they do not risk sub-zero temperatures, which could freeze the spit in their mouths or transferring moisture to another's lips where it may freeze quickly. In New Zealand, the Maori tribe practices a similar ritual and it is reportedly found throughout the Pacific. Whether it traveled there from the Inuit or the other way around, only anthropologists and historians may speculate. Some cultures consider the act of kissing so intimate that it is akin to having sexual relations in public. These cultures still kiss, but kissing is reserved for private moments between partners, behind closed doors. Public kissing between men and women is illegal in many strictly orthodox Muslim countries as an act too intimate. Conversely, many men in Arab speaking (and Muslim) countries greet each other much like the French do with a kiss to each cheek. Although in western nations, French kissing refers to tongues twining, not kissing each cheek. This may date back to the display of open arms and no hostilities between medieval rulers who would greet each other thusly as divine brothers at a time when Kings were considered just a step below the divine. Even in Western countries and within the regional United States, kissing across different cultures is regarded differently. For example, children may kiss on the mouth when very young but are discouraged from such acts as they achieve puberty or sexual maturity. Kissing friends is not as accepted in some parts of the U.S. as it is in others. Some families are more reserved, conserving hugs and kisses for the very young. Some families only offer perfunctory acts such as kissing the air next to someone's face rather than actually kissing them. The kissing of air around someone's face is often associated with popular kids in high school who are sharing teasing affection without creating real intimacy. Whatever kissing means to you personally or within your culture, for most it remains a highly personal act. Be aware of that before you explore kissing in different cultures. It is an easy mistake to make and for some, the offense is grave indeed.